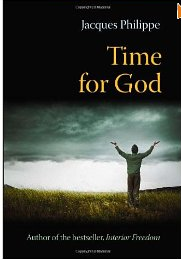 Time for God by Jacques Philippe is published by Scepter Publishers and has been translated from French by Helena Scott. I recently heard Jacques Philippe speak on his very first trip to the United States and purchased his book at the event. He exudes peace and love and gently shows the way for us to spend time in prayerfully loving God as a vital way of life. As I read the book through the first time, I felt the warmth and joy of the Holy Spirit. Then I went through and read the book again slowly, underlining the parts I wanted to meditate upon more deeply. The main idea is about praying with our hearts, not with our minds. This is very different from praying with our emotions and feelings because these are so changeable. Instead it is deliberately making a type of prayer best described as contemplation where we sit with God in a loving attitude allowing Him to love us as we love Him. Finding God through the beauty of creation, the Eucharist, Scriptures and within our hearts. After reading this book I purchased 5 more copies to give to people I know. I feel very strongly that this is a type of prayer that few of us practice and one that will revolutionize our spiritual lives if we do. Because this book was translated from French and also because of the historical theological roots of his thoughts, some of the terminology may be new to readers who are in non liturgical denominations. However these words, such as docility, are easy to relate to and Rev. Jacques speaks with simplicity so that the concepts are easily understood.